1. Pay day. Our pay day came in early because of the long-weekend. Happy to say we have the most considerate accountant-HR in the office. I portioned the amount and set aside money for my rent and other bills, allowance, savings etc. My BPI Maxi Saver and Save-Up accounts are filling up nicely too, a little more to go to reach my target for this year. 2. Night market trip. My friends and I heard mass for the feast of Our Lady of Holy Rosary. 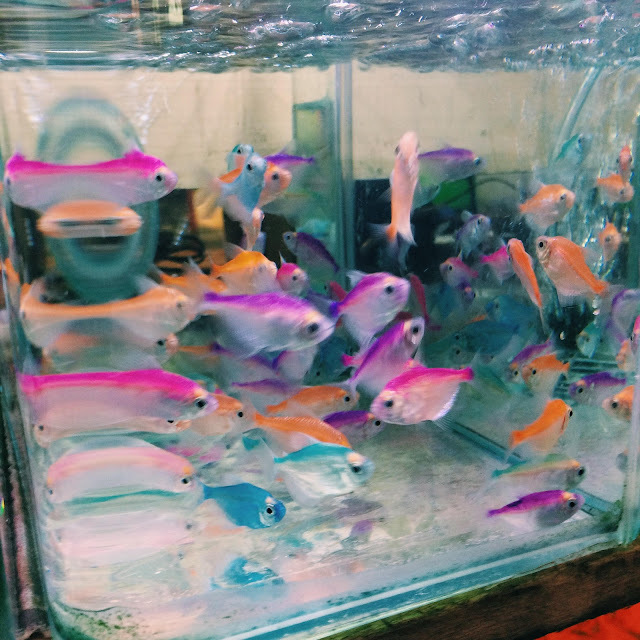 There's a night market near the church where we found these really pretty school of fish. 3. The sunset photo above sent by Agnes. Agnes told me my two goddaughters are adjusting well in Japan. The elder Emi is no longer crying at night, while my little Lisa can now speak one complete sentence. The sea is a 5-minute drive from their place so they go there often to play and run around. I miss them so much. 4. Pan de sal. 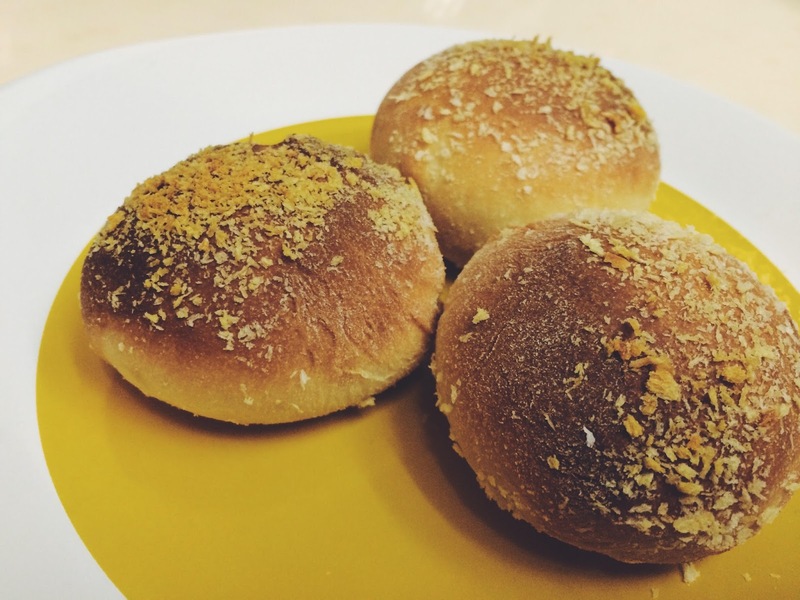 It was my first time to make pan de sal from scratch and it turned out really good. I still have to find finer breadcrumbs for the topping to make it more 'authentic', but the taste itself is legit pan de sal! 5. Cook out. I really enjoy cooking and so during the long weekend, I whipped up a meal for my friends. I was too energetic last Saturday, probably from the 3 bowls of sibut (Chinese traditional herb/medicinal soup that Auntie Maria made. I didn't get tired baking and cooking the whole day. 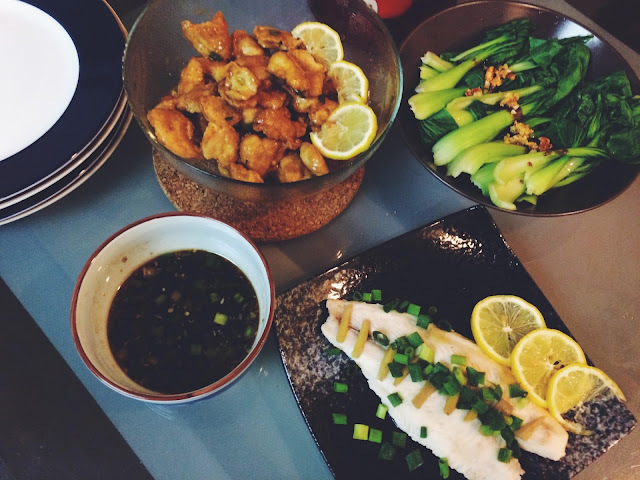 Our dinner spread consisted of orange chicken, steamed fish and blanched pechay with garlic. 6. Little catch up with a friend. My friend Ate Rina is now based in Singapore and she always sends random Viber messages to me. Since I was feeling a bit low lately, I opened up to her. It's always nice to hear someone's words of wisdom, especially when they're older than you. 7. RT Mart and Costco trips. I'm trying to save all that I can lately, so I go crazy over cheap deals. My friend Abby and I went to Costco but found out that nearby RT Mart (Taiwan's version of SM Hypermart) was on sale. We didn't buy anything from Costco, but rummaged through the aisles of items that were on sale in RT Mart. 8. Shangri-La voucher. Ahia was finally able to use my Golden Circle voucher for dinner at Circles Makati Shang last night. It was worth more than US$150 from all the points I accumulated in my hotel stays last year . He brought my mom and my uncle for dinner. I'm just happy seeing them together enjoying a good meal. 9. Dihia's random messages. My dihia's been sending random messages from the watch that he wants to buy, to helping him translate some words into Mandarin because his co-workers are from Mainland. I miss this guy so much. 10. Ahia's good news. This is the highlight of my week. Our prayers have been answered and I hope everything goes well. Thankful for another week, despite the crazy amount of work in the office. Prayers are really very powerful and can certainly move mountains. Glad your prayers were answered. Awww, I'm like you. I try to save as much as I can right now because of some big decisions I'm planning to make next year. It's always nice to read a happy list. 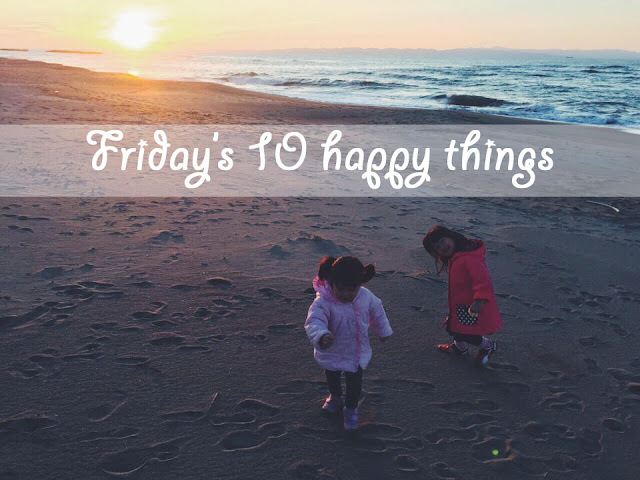 It reminds me of the simple joys in life. PS: Sarap naman ng niluto mo! Buti ka pa marunong magluto! Hehehe! You have a lovely blog, and I really like the Scripture you are sharing. (on the left side of your blog). Warm greetings from Montreal, Canada. Miss Jacq! I got your package na! Kyaah, I super love the handwritten note =)Take care and I look forward to more of your updates soon!